Here’s some eye opening info… Cancer chemotherapy treatment is a type of drug therapy that usually involves a combination of drugs administered under a specific regimen. A round of chemotherapy kills 99.9% of the cancer cells. So why aren’t people getting cured from cancer all the time? Well, in a disseminated, metastatic cancer, there are about one trillion cancer cells. That’s 10^12. Or in other words 1,000,000,000,000 tumor cells. If you subtract 99.9% from 100%, we are left with 0.1%. So what is 0.1% of a trillion? So how come we’re able to get so close to 100% but we’re not hitting 100%? 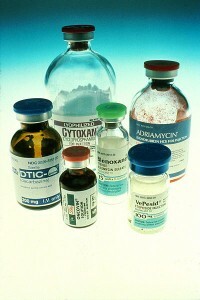 A cell needs to be replicating or active in some way to be affected by a drug. The cells that are not being affected by the chemotherapy are in the dormant phase. Antibiotics work on the same principal as well. If a bacteria is dormant or replicates very slowly, then the antibiotics can’t affect it. We have nasal inhalers as well and not just oral inhalers. If we’re going to use a steroid nasally, we’re trying to treat sinus reactions or what we could call allergic rhinitis (inflammation; difficulty breathing). Some particular nasal inhalers cannot be found on the market anymore because they were propellant inhalers and the government forced them off the market because it was harmful to the ozone and now they must only be made of an aqueous solution. It’s a pump spray as opposed to an aerosolized spray. You have to provide the power instead by pressing down hard. Many patients will complain that these aqueous solutions will burn and are not as comfortable to use but we have no other choice. Another issue we have is that we have to make sure the solution or inhalation is getting into their lungs as opposed to swallowing it and it going into their stomach. This can be problematic for some individuals, especially children. The way we teach an individual to utilize an inhaler is exhale all the air they can and then they must be able to coordinate putting it into their mouth and inhaling as they are pressing down at the same time. They must breath in for as long as possible as they press the inhaler. Some individuals can’t coordinate and it goes into their stomach instead. For those, a spacer device was created. Instead of putting the mouth piece into their mouth, it goes into this chamber. We press the dose and the dose sits inside the chamber. When the person is ready all they have to do is take a deep breath in. When we’re dealing with children it’s a face mask instead of just a bottle opening. We talked about H2 receptors previously. They are found in the stomach and when stimulated, acid is released, which is important for digestion. We have a problem though if an excess amount is being produced, especially if an ulcer is present. So H2 blockers stop this secretion but it still takes 6-8 weeks for an ulcer to heal regardless. It’s a good drug class to help prevent ulcers from recurring. A patient with idiopathic ulcers may be on this drug. Also patients who have to be on drugs long term and may develop drug induced ulcers may also be on an H2 blocker. Our biggest problem is nocturnal acid with antacids but this is long acting enough so it works long enough. Ranitidine (Zantac) – p.o., inj. Proton pump inhibitors work on the stomach and instead of working on the histamine receptors, they work on the proton pump. This is especially useful with GERD which is a fancy medical term for heart burn. When someone is having heart burn, the acid is not being blocked by the esophageal sphincter valve and it’s going up. Historically, people suffered a lot and the proton pump inhibitors were a major breakthrough. It not only relieved symptoms but also prevented esophageal cancer (because all the acid in the esophagus causes dysplasia of the cells). This also works down the tract and promote the healing of an ulcer but also takes 6-8 weeks. Examples: These are all easy to recognize as they all end in -prazole. For these to work the best it can, the drug needs to enter the proton pump the best it can. These are administered just once a day, so the best timing is to be dosed 30 minutes before a meal. The person consumes it 30 minutes before a meal, it goes into the blood stream, and when the person consumes the meal, the pump starts working. When the pump is working, that’s when the drug gets into the pump and quite literally “clogs up” the pump so it doesn’t work for 24 hours. An antacid is a base that neutralizes this excess acid. This excess acid is what could be causing the ulcer or making it worse and preventing healing. So we neutralize the acid with an antacid so the ulcer is no longer being irritated and can heal. It provides almost instant symptomatic relief. It promotes healing of the ulcer which unfortunately takes 6-8 weeks. The goal of an antacid is to buffer the stomach pH so it is between 4-5, which is still very acidic but the stomach pH is normally 1-2. We don’t make the stomach be completely neutral (pH of 7) because that will cause a reaction called rebound acidity where the stomach will put out more acid than usual. We administer antacids at times when we are going to have the most amount of acid: Usually 1 hour after a meal and 3 hours after a meal. We don’t have slow release antacids so we can’t control what happens to the pH at night (short of taking antacids in the middle of the night), which causes our therapy to fail. Sodium Bicarbonate (Rolaids): This is our best neutralizing antacid but it has a lot of sodium. Our problem with it is that it may be “too good” making the pH exceed 5 and we risk rebound acidity. Aluminum Hydroxide (Alternagel, Amphojel): weak antacid but it’s constipating. Magnesium Hydroxide: good antacid but it causes diarrhea. So how do we get around this problem of one causing constipation and the other causing diarrhea? We combine them! And this is known as Maalox or Mylanta as it’s both Magnesium Hydroxide and Aluminum Hydroxide mixed together. Tums also falls under antacids. It’s calcium carbonate (instead of sodium carbonate) and not as strong as these others. When we’re dealing with tums, it’s usually just to provide relief from stomach upset. The calcium in calcium carbonate is also not very well absorbed and it must be taken with other foods. Some people even take it for the calcium itself. Sucralfate is a non-absorbed disaccharide. In other words, it’s a double sugar that never gets absorbed. For some very unknown reason, this particular sugar gets attracted to ulcers and forms a gelatinous barrier over the ulcer. It’s like putting a band-aid over the ulcer, preventing the acid from getting it to it, allowing the ulcer to heal in 6-8 weeks. This cannot be used prophylactically because if an ulcer doesn’t exist, it has no where to bind to. We constantly hear the term of a stress ulcer. When we hear stress ulcer, we are talking about physiologic stress, not psychological. Ulcers are physiologic, and almost all patients that go in the ICU will develop stress ulcers because of all the corticosteroids being released. So just about every patient in the ICU will be given prophylactic drugs that prevent stress ulcers. Alcoholism also causes them as well. Then there’s also the idiopathic ulcers, which mean we have no idea why they’re happening and these people will be on life long prophylactic therapy. Certain drugs such as NSAIDs, aspirins, corticosteroids cause ulcers too. The overgrowth of Heliobacter pylori can also cause ulcers. We’ve talked about antibiotics before so we’re going to go over the other options below. There’s many possible causes for diarrhea. Too much osmotically active particles in the GI tract, such as too many salt laxatives could be one reason. Increased rate of intestinal secretions. Alteration of the permeability of the intestinal lumen (such as Crohn’s disease). Increased rate of peristalsis (could be drug induced such as by saline cathartics). And of course, infection where there’s bacteria and toxins. Since narcotics decrease motility and normally cause constipation, they are useful for symptomatically treating diarrhea. This would never be used however if we are dealing with an infection because it wouldn’t allow the bacteria to pass through. An adsorbant is consumed orally, goes into the intestinal tract and binds up the bacteria and toxins in the intestinal tract. It can also bind up medications and vitamins, so you don’t give those at the same time. An example of an adsorbant is bismuth salt (peptobismol, kaopectate). The full name is bismuth subsalicylate. If a person has an allergy to aspirin or any salicylate, they can’t use this, but more importantly, you shouldn’t use this in children because of Reye’s syndrome. Reye’s syndrome is associated with salicylates and viruses. The diarrhea could be caused by a virus, so do not use this in children. Can an adsorbant be used prophylactially? Yes. If you’re traveling somewhere that could cause diarrhea, you could take it daily to prevent, but you’re going to need a lot of peptobismol! If an individual has had a bout of diarrhea, their normal flora in their intestinal tract is not normal anymore. To replenish it, we want to give them lactobacillus acidophilus. There’s a prescription grade of this and you’d only find it in the refrigerator. And if you don’t have the prescription grade, there’s another way to do it, at least in the ambulatory setting, and that’s by eating yogurt. Yogurt has this bacteria in it. When someone is going to go on a broad spectrum antibiotic, there’s always a risk of super infection or yeast infection and we can give yogurt products. We shouldn’t give it at the same time though. We have to wait for the antibiotic to be completely absorbed and then consume the yogurt. For most individuals, such as adults, this isn’t a problem, but babies/infants lose a lot of electrolytes and fluids and it needs to be replaced. There’s a product called pedialyte and the manufacturer will flavor it anyway possible but it still tastes salty. The colder it is however, the more palatable it is, which is why they’ve also made the popsicle version of it. An adult could also get away with drinking gatorade but the problem with that is it has tons of sugar in it. This drug class directly causes an irritation which then causes the intestinal mucosa to have a reflex reaction of peristalsis. Stimulants will work very quickly and work in a matter of 2-8 hours so it can work for acute constipation and to evacuate the bowels for exams. If too much peristalsis occurs, the patient may complain of cramping. This is also habit forming and very much abused. Senna (Senokot): People think this is the best way to go because it comes naturally from a plant. They think it’s not habit forming. There’s no difference between what’s in a tablet of Senna or a tea of Senna. Bisacodyl (Dulcolax): Commonly seen in hospital, can be given as a tablet or suppository.